Experts in the health-care field feel that the benefits of exercise after a stroke bring increased endurance physically but psychologically as well. There have been studies that lead many of those experts to believe that survivors of strokes will stave off the possibility of future strokes with the proper exercise we well. Exercises that may seem minor but can do so much are hand and finger exercises. For the affected limbs, exercise can help a survivor regain movement and the hand and fingers are no different. There are many publications and health agencies that state for the road to recovery to open up, exercises of the hand and fingers are important. Which side is affected by a stroke is related to which side of the brain that the stroke took place. It is normal for that side of the body to experience paralysis and the victim to lose most or all of the functions of one hand and the fingers. A stroke that occurs on the left side of the brain will result in the right side experiencing paralysis and if a stroke occurs on the right side of the brain, the left side will experience the paralysis. A stroke will affect the fine motor control of the victim’s brain so that simple everyday tasks such as eating can be a challenge. Fortunately today there are products on the market such as Amefa Utensils Curved Handle that offer eating utensils made of lightweight stainless steel with built-up black plastic handles. Stroke victims will find the curved handles easy to use and require very little wrist movement. A serrated blade on the "L" shaped knife cuts with an easy rocking motion. The American Heart Association suggests that victims of a stroke can relearn their fine motor skills with hand and finger exercises that require repeated use of the limbs on the affected side. The communication between the brain and that area will start to respond better with repeated motion exercises. This is an exercise easily achieved with the Xtensor Hand Exerciser . While conditioning the muscles and tendons that open the hand with resistance training it is also building strength. This product is equal to the exercises like repeatedly pushing affected hands and fingers against a pillow or mattress. To help a stroke survivor retrain their fine motor skills, AMA recommends exercises placing pegs in peg boards then removing them or shooting marbles into a box several times during the day. With TheraBand ® hand exercises will not only increase hand motion but strengthen the survivors grip too. With five different levels from weak to strong, the user is able to increase their ability as they get stronger. It is just as important for the survivor to exercise the parts of their body that are not affected too. By exercising the already working parts of the body, it pushes the healthy part of the brain to restore the affected part of the brain. The Carex Pedal Exerciser is the perfect tool to do just that. 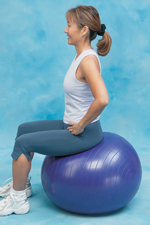 Place it on a table top for arm exercising or on the floor for the legs. The survivor will be stimulating circulation and toning muscles at the same time. While dealing with the affects of a stroke can be overwhelming, there are plenty of gadgets, tools and equipment to help ease the survivor into a rehabilitation regiment. Getting that exercise is what experts feel will get a stroke sufferer back to a normal form in no time at all.